February 29th today. Superman's birthday, if I recall from my DC days. More pertinently, the final day to purchase some qar tax for the Qashqai. Quickly does it! You'd think they'd knock a few quid off if you leave it until the last few minutes, but not so. Quality web forms, though, unlike some Nissan nonsense I used last week which rejected a registration number because it contained a space character. Numpties. Those singles had already put us comfortably ahead before Ed and Yang added a rare doubles point with a fine win. 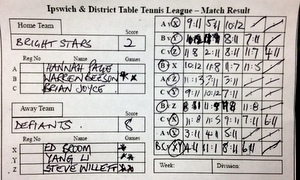 An 8-2 victory equals our best result of the season and should go a long way to retaining our div2 status. Nice!